The Theory of Everything isn’t necessarily a bad movie as much as it is offensively inoffensive. Instead of a complex look at a genius who kept going even as the world told him to stop, we are treated to a sweet, if trite, love story. Then again, this is based on the book written by Jane Hawking, Stephen’s first wife. She definitely sees him through some very rosey red glasses. Normally, I commend it whenever a biopic tries to focus on a specific period of time or one small aspect of someone’s life, as opposed to an overarching story. However, it would have been interesting to see The Theory of Everything go a bit more broad. Sure, the Hawkings marriage is lovely and inspirational, but it is far from the most interesting subject that this film could have covered. Luckily, the film did manage to rope in two very talented and very British actors for the lead role. 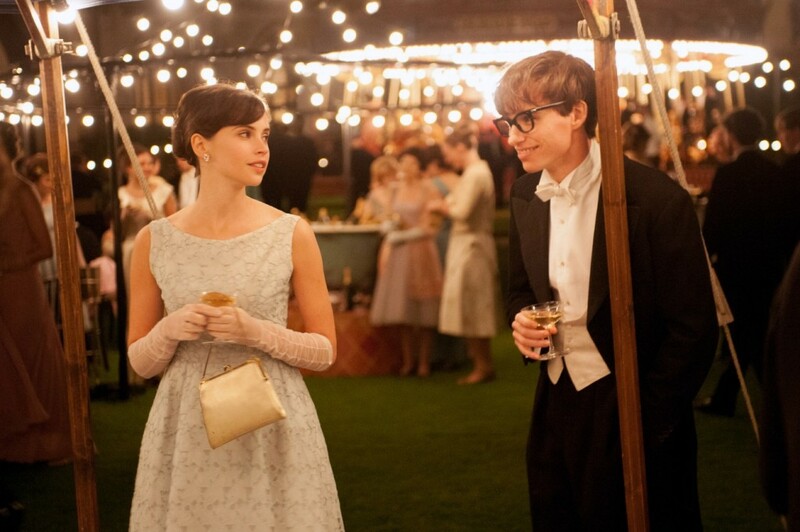 As Jane Hawking, Felicity Jones steals many of the scenes that she is in with a sort of quiet strength. She has the less flashy performance here, yet she gets a lot of mileage out of it. One problem with a lot of biopics is that a lot of the ancillary characters can feel disposable. I cannot tell you how mad it made me to see how Walk the Line made Johnny Cash’s first wife look like a lunatic. She was just a plot point to be overcome so he could get to June. One of the stronger parts of The Theory of Everything is that it lets Jane hold her own. Then again, this might not be that big of an achievement, given that it is based off a big that she freaking wrote. Now, let’s get to Eddie Redmayne, who plays Stephen Hawking. There is a strong chance that he will get back in his Uber tomorrow night cradling an Academy Award. That is not just because he has swept most of the precursor awards, but because this is exactly the kind of performance Oscar voters love, to the point that it almost feels like parody. There is a lot of grinning and shaking and tripping but not a lot about how Hawking feels as he watches his body deteriorate before his eyes. I hate to say this, but it feels a little to a lot like Simple Jack from Tropic Thunder. Redmayne seems to be trying his best. This might be more the fault of the film itself than the actor. After all, actors are trained monkeys who can eat a lot of Burger King and then say they are just gaining weight for a role. It feels less like this film wanted to give us a portrayal of Stephen Hawking and more like it went through the least amount of effort possible in order to be eligible for an Oscar. The film keeps telling us that Stephen Hawking is a genius. Nobody is arguing against that. What I would like to know, however, is why he is such a genius. How is it that he can look at a cup of coffee and figure out how time works? How is it that he can look at a fireplace and figure out what black holes are? Instead, the film just decides to cut right to the part where A Brief History of Time is published and becomes a bestseller. Again, why exactly are Hawking’s findings so revolutionary? I am an idiot who knows nothing about physics. Please help me. Again, The Theory of Everything is less bad and more bland. It doesn’t do anything interesting cinematically. If you are looking for something mildly sweet and filled with lens flares and soft lighting, then you will probably enjoy The Theory of Everything. Even if you do, you probably won’t remember much of it down the road.